That's me ... Carmen Tellez. I run this crazy idea of a providing professional entertainment & party rentals. AND, Our team is always expanding. We are here to help you. 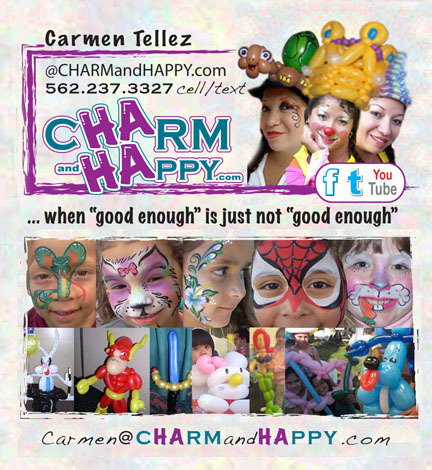 In a nut shell, we specialize in Family Entertainment like Comedy Magic Show, Puppet Show, Games Master and the like. My personal passion is Face Painting & Balloon Art. The best work is created when the best surroundings is provided. That means the appropriate time, shade and the appropriate number of children or guests. Contact me for those kind of details. Selected entertainers constantly polish their specialty skills to keep fresh ideas just for you. We keep what tickles your funny bone and purchase new props to replace the old. Our professional attire and costumes are maintained for excellent showmanship. As an adult, little ones are not the only ones who enjoy entertainment. We offer special entertainers for the family style humor for adults as well. You are always welcome to ask questions! You need to know who you are inviting to engage with your kids, family and friends. We only allow wonderfully cute, fun, experienced and enchanting energetic entertainers to be a party of our nationwide network. Skill levels vary and pricing is accordingly. Remember, if you are calling and our answering machine picks up, please leave and message including your name, phone number, city and date of your event and the kind of service you are interested in. We will return your call just as soon as possible. Or you may want to just email us. We keep on file certificates of appreciations from local police departments, mayors, the sheriff, hospitals, health clinics and thank you notes from parents and other well respected companies. Expect Fun and Excitement! Our entertainers are just that, yet not obnoxious. We can also detect when there is a shy child. It is best for a shy child to observe entertainer from a distance. When ready, the child can let you know when ready to approach the entertainer. The entertainer will Never force fun on shy ones. If there is a party need you do not see here, please let us know about it. Customer responsible for any and all city, residential and park permits. Check location City Hall or Parks & Rec. Dept. Some locations require "Additional Insured Named". This kind of additional insurance takes about 2 weeks if Risk Management for park requires also an "Original Certificate". Plan entertainment well in advance to assure availability. Inform guests in invites your planned activities schedule. Hire appropriate entertainment for appropriate age groups. Example: kids over 8 years old may prefer a Games Master or Balloon Artist or Face Painter rather than a Clown and so on. Designate space for rented equipment or hired entertainment. The last thing you want to see is your party or event ruined due to not having the space need to complete your order. Hire our services for a reasonable amount of time to smoothly entertain the number of guest you'd like us to accomodate. Remember "Haste makes waste". We prefer not to rush, for quality sake. During rainy weather, we require shelter to be provided for both guests and entertainers by our customers. During hot weather, we suggest shade to be provided for both guests and entertainers by our customers. Children are uncomfortable when getting their face painted as the sun is beaming in their eye. Have you seen our online party supplies store? THANK YOU!